CUSTOM 5 or 3 Pt. DERBY COVERS IN STOCK! Doc’s has these and MORE Custom Made Chrome Derby Covers(points covers also) available for anyone who wants to make their motorcycle look that much more impressive. Want to feature your Unit, Doc’s can Custom Make the Cover with any design you seek!! 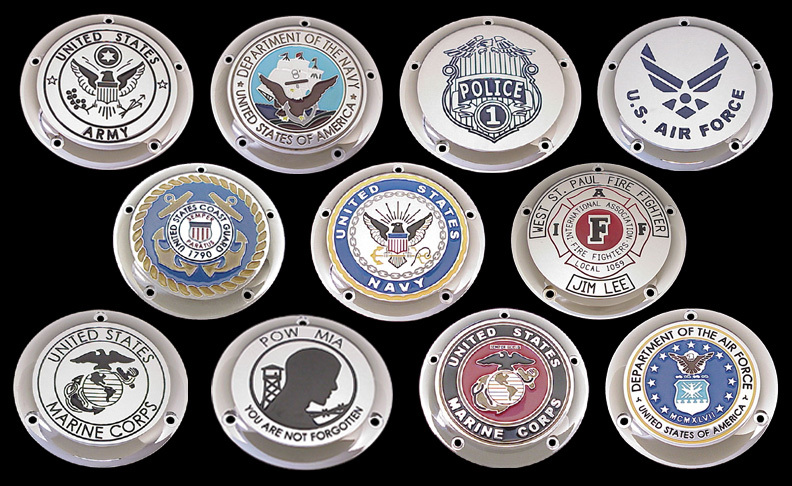 Army, Navy, Airborne, Recon, Fire, or Police, you get us the design and we will make it happen. For more information visit our online store at http://www.docsmc.com and goto our Military Products Links. CHECK OUT SOME GREAT PHOTOS OF DERBY COVERS WE HAVE BY CLICKING HERE!! !